Our Java Programming and Java Development services in Raleigh NC, Dallas TX, Miami FL and throughout the USA includes Windows, Android, Blackberry, and iOS mobile platforms. There are many popular object-oriented languages available today. Some like Smalltalk and Java are designed from the beginning to be object-oriented for developers and programmers. Others, like C++, are partially object-oriented, and partially procedural. In C++, coders can still overwrite the contents of data structures and objects, causing the application to crash. Thankfully, Java prohibits direct access to memory contents, leading to a more robust system. Why use Java Development & Programming? 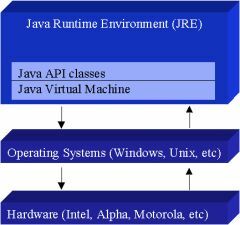 The original impetus for Java was the need for a platform-independent language to produce code that would run on a variety of CPUs under different environments. Coincidentally, about the same time, the Internet started gaining force which propelled Java to the forefront of computer language design, because the web demanded efficient programs that were portable. “Write once; run anywhere, anytime, forever" – therefore became the tag line for Java coders, programmers, and developers. Rather, it is a highly optimized set of instructions called bytecode which are to be interpreted by the Java run-time environment, popularly known as the JVM or the Java Virtual Machine. Java is thus both compiled and interpreted. Firstly, it makes Java platform-independent as only the JVM needs to be implemented for each platform. Secondly, it makes Java secure because the entire program is in control of the JVM which prevents it from generating malicious side-effects outside the system. 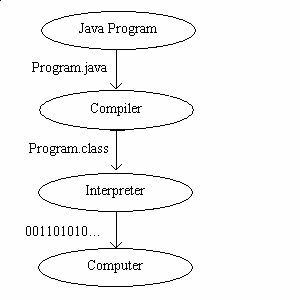 However, Java also does provide means of “on-the-fly compilation" of bytecode into native code in order to boost performance by the use of JIT (Just-In-Time) compiler, the brainchild of Sun’s HotSpot technology. A JIT compiler compiles selected portions of the bytecode directly into executable code as and when required during execution. The rest of the code is simply interpreted by the JVM. Java encompasses nearly all the benefits provided by its OOP predecessor C++ and at the same time provides an all new clean, usable, pragmatic approach to objects. The three OOP pillars – 1) encapsulation, 2) polymorphism and 3) inheritance together with new features like Interfaces, Exception-handling, Multithreading, Generics, etc. have made Java the modern programmers’ first choice. A striking difference that Java has with C/C++ is that it does not allow the use of pointers. This feature single-handedly makes Java immensely secure as programmers can never directly access the memory. Java is also extremely dynamic as almost all the Java code (except the “static" parts) are late-binded, i.e., dynamically linked at run-time by the JVM. Another distinguishing feature of Java is that there are no Header files or Libraries – instead there are Packages that are imported. In Java, everything encapsulated in classes and packages are nothing but containers of classes with similar functionalities. This feature allows us to create two classes with the same name if they are in different packages. The java.lang package is imported in all programs by default; other packages need to be imported explicitly when they are required. Java also relieves the programmer from the burden of memory management. In Java, memory is dynamically allocated with the “new" operator and automatically reallocated with the help of the “Garbage Collector" that automatically runs from time to time and frees objects that do not have any references pointing to them, thus preventing “Memory Leak" to a huge extent. Fully cross platform APIs including support for Graphics, Windowing and Multimedia. High density of OO design patterns put to practise compared to C#/.NET. This makes developing complex applications much easier. The Java Community Process allows people with an investment in Java have a say. New Java features can be proposed, discussed and voted for in an open democratic forum. Smallest unit of distribution is a class (.class file). This helps in application development, debugging and deployment. Having a one to one mapping between types and the file system is simpler because file systems are well understood. Good IDEs are available (Netbeans, Eclipse, Together). Many are free and support more features than VS.NET. Unfortunately many are slower than VS.NET. Is PHP equal or better in comparison to Java programming? The root of this dispute boils down to the development of IDEs (integrated development environments) and how each language has handled objects over time. Originally, PHP didn’t support OOP (object oriented programming) until PHP4, and didn’t have a strong IDE. Since PHP 5.3 however, its support for OOP has improved tremendously. Furthermore, in the past few years or so, some really great IDEs have emerged to support PHP development. Java on the other hand has always been uniquely defined by its OOP nature, and has has always had great IDEs. Thus Java with all its features is a complete programming solution for a number of real-life applications that were difficult to implement previously. Java’s portability, robustness and efficiency on almost all popular platforms like Android, Windows, Linux and Blackberry has easily made it the modern programmers’ first choice.